"Chicken, kielbasa and shrimp are mixed with a bold combination of Swanson® Chicken Stock, rice, turmeric and salsa to make a colorful dish that's a real crowd pleaser." Heat the oil in a 12-inch skillet over medium heat. Add the rice and cook for 30 seconds, stirring constantly. Stir in the stock, salsa and turmeric and heat to a boil. Reduce the heat to low. Cover the skillet and cook for 15 minutes. Stir in the kielbasa, shrimp and chicken. 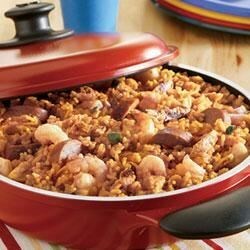 Cover the skillet and cook for 5 minutes or until the rice is tender and most of the liquid is absorbed. A creamy savory soup created by Allrecipes Allstar, Diana. Whole family LOVED it!! I used a medium salsa and Tyson's ready-grilled chicken strips. Also, turkey sausage for less fat. Super easy and made a TON!! Looking forward to leftovers for lunch!! I had to add more liquid because the rice was not fully cooked. Another 2 1/2 cups of broth took care of that. I have made this 3 more times since I have tried it the first time and it's a Hit EVERYTIME!! !We can't get enough of it and it's prepared & ready to eat within an hour!!! I used hot and spicy Italian Sausage because I don't care for kielbasa. I pretty much followed the recipe after that and we liked it a lot. It is easy to make and very flavorful.